GREAT NEWS: I did it!!! Last week I got that email everyone who has submitted a BCG portfolio hopes to get… “Congratulations and welcome! I am delighted to report that your application for BCG’s Certified Genealogist credential has been successful.” Hallelujah! What a journey! It began 10 years ago when my friend and mentor, Birdie Holsclaw, encouraged me to create a lecture describing all of the obituaries I had collected in my first few years of research. At that time it was somewhere over 100 (today it is closer to 300 but I lost an accurate count). A few years later, she suggested I look into Certification (from the Board for Certification of Genealogists) and think about working toward that goal. 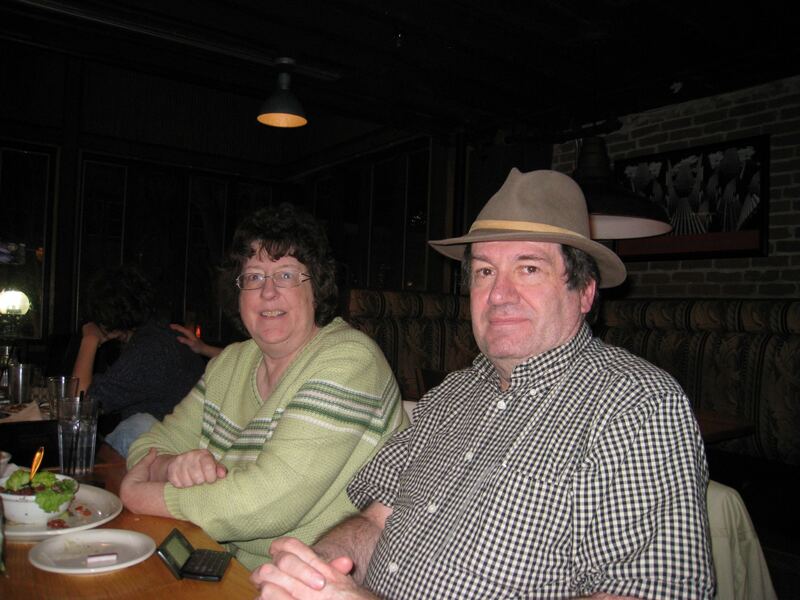 My friend Birdie died on 13 May 2010 from cancer. After her death, I became sad whenever I tried to work on any of my genealogical research and so I spent some time away from it. But I loved it too much to stay away for long. In 2012 I got some renewed energy and decided to make it my full-time gig. GenealogyPANTS was born in March of 2012. I decided that instead of being sad that Birdie was gone from our midst, I should do the things she thought I could do. I decided to pursue certification in her honor. If she thought I could do it, then I should do it. I should see if she was right. Along the way I met others who thought I could do it as well. The knowledge that someone is pulling for you, has confidence in you, and will stop what they are doing to send you an encouraging email or answer a question is a powerful thing. This knowledge helped me finish my portfolio. All of the things that these genealogists do for the genealogical community at large to educate us contributed to my success. Tom Jones for all of the educational materials he has written over the years, classes and lectures he has taught, for answering several emails in super-quick fashion, and for just being one of the most approachable and patient people out there. Judy Russell also for all of the educational materials you provide to us (via The Legal Genealogist blog and all of the lectures and classes) but also for being so clear AND fun in your lecture style. It makes learning about potentially boring topics so much fun and NOT boring. I mean we each have our interests, but Judy has the ability to make you really want to learn about historical laws and their genealogical impact even if you were an art major in college! Elizabeth Shown Mills for all of the work she’s done on making citations understandable through not only her books but also her Evidence Explained website; also for her informative lectures and classes. I’m honored to have been among the last Course 4, Advanced Methods class at IGHR and I’m honored to have gotten the coveted “gold seal” AND the Walter Lee Sheppard Jr. Prize. I have to admit that the thought of “Elizabeth Shown Mills thinks I can do this!” really, REALLY helped me finish and succeed with my portfolio. Mark Lowe for being another one of those educators that just makes learning fun and for telling a great story every time he speaks. Mark can really get into the emotions of why genealogy is important. Also, for being so approachable, supportive and just a great genea-friend! To my genealogy “support group” which consists of Annette Botello, Ruth Ratliff, Deb Skoff and Denise Miller. This group also included Birdie and she was always so encouraging to us when we met and so generous with her time. This group has been such a blessing to me not only genealogically but personally! Thanks you guys! To the members of the CERTS group I was a part of that included: Beth Benko, Kirk Patton, Deena Coutant, Harry Ross, Karlene Ferguson, Diane Barbour, Margaret Kadziel, and if there are others I’ve missed, please accept my apologies, but this group tended to morph a bit so I hope I didn’t miss anyone. And so to conclude, I’m grateful. I’m grateful that this part of the process is over, I’m grateful for all of the support I’ve had and I’m grateful that I had the chance to know and work with and be friends with one of the best people on the planet. Plus, I’m so excited to start this next part of the genealogical journey, watch out! I turned it in. It is over. This MAJOR accomplishment is done. I TURNED IN MY BCG PORTFOLIO! Honestly, I don’t know if it’s any good (I am my own worst critic). I have been looking at this project for a couple of years and almost non-stop for the last 3 months. I am not sure who or what it’s about anymore, if I made any valid arguments, or if it even contained complete, coherent sentences. If you’ve ever undertaken a major project you know what I’m talking about. You get so close to it you can’t see it anymore. The words blur together. And even though it makes sense to you, who knows about the rest of the world. Let me say this: whether or not I pass doesn’t matter at this point. I did it. It is done, over, finished, kaput and off to the judges. I turned it in and it is out of my hands now. I also know I did my best given all that has happened to me and my family over the last four months. In case you didn’t know: we moved from Colorado to Texas, bought a house, sold a house, packed, unpacked, got kids into school, and are still adjusting to life in a new and almost foreign state. And I finished my portfolio. I think I will say it again because I’m not sure I believe it yet: I finished my portfolio. I am a better genealogist for having done it. I have learned more about citations that I ever knew before. I know more about my methods of being organized (or disorganized) and worked on ways to improve all of it. If I don’t pass this time, I will be doing it all over again because when you have a goal you can’t give up or you’ll never make it. And I know that my mentor Birdie Holsclaw told me I could and should do this, so I will keep working at it until it happens. There were a couple of good things I learned that I will share just in case you don’t already do these things. Keep a log of the documents you’ve requested, sent off for, asked a friend or colleague to copy, etc. I found that I got so many balls in the air toward the end and while I was moving that I had a few documents “on order” that I lost track of. I needed to follow-up on them because they weren’t in my hands weeks before deadline and then I scrambled to get them, failing to do so on one important document. (This is the one thing I can’t get out of my mind.) Keep some kind of log and keep track of those document requests. I know you’ve heard this, but I’m going to say it too. Write those citations, fully, as you gather the information. I don’t know how many hours I spent trying to “re-find” things, fill in volume, page, column, enumeration district, and microfilm numbers so I could create an appropriate citation. And I’ve been doing this for years. I know better! I spent too many hours, that’s for sure. And I can now say with certainty that I will ALWAYS write my source citations the minute I find something. Seriously. I am not exaggerating. Start writing right away. I tried researching first, filling in boxes in my software and creating check-off charts to be sure I covered everything. I still ended up doing a lot of research during the writing phase of the process and then felt like I was crunched for time at the end. I say forget it and just write. I ended up doing things like color coding sentences that needed more research, writing “find a source for this” in the footnotes, and coming back to it later. Get it all out there, on the computer screen, as much as possible, and then go back and work on it, and then go back and work on it, and then go back and work on it some more. Eventually it will all come together. I’m sure there are some more “tips” I could give, but these are the first things to come to mind. I’m glad it’s over. I was getting really tired of those surnames and after a while I started getting confused about who was who. I’m happy to have it completed before the holidays and I hope all of you have a great holiday season and happy new year! Pray for NO DIRECT EVIDENCE! So, I went “on the clock” (for BCG certification) in December 2012. In the meantime a lot of “life” has happened but a lot of “life” is going to happen when you take a step like this. I’m the type of person who needs a deadline, so I went on the clock. Once I sat down and tried to locate a family/problem for my case study, I got concerned. One look at my office, my binders, my computer files, told me that I was horribly unorganized and I needed to do a lot of catching up, fixing, data entry (I have a thumb drive with scans from Salt Lake City from 2009 that I haven’t worked with yet!) and organizing, before I could even make an educated guess on the case study. Well, in the last week, I went through a very large pile of notes with “to-do” items on them, some dating back to 2003. They said things like “find tombstone for …” or “locate obit for …” or one sticky note “I am not convinced that ––– is really –––’s father.” (Names being left out in case this REALLY is my case study.) That one sticky note sent me on a swirl of reviewing documents, notes, computer files, quick look-ups on Ancestry and FamilySearch. I MAY just have found my case study. I have a few pieces of indirect evidence but nothing conclusive that says who the parents of my subject are. This project is so counter-intuitive for the genealogist. 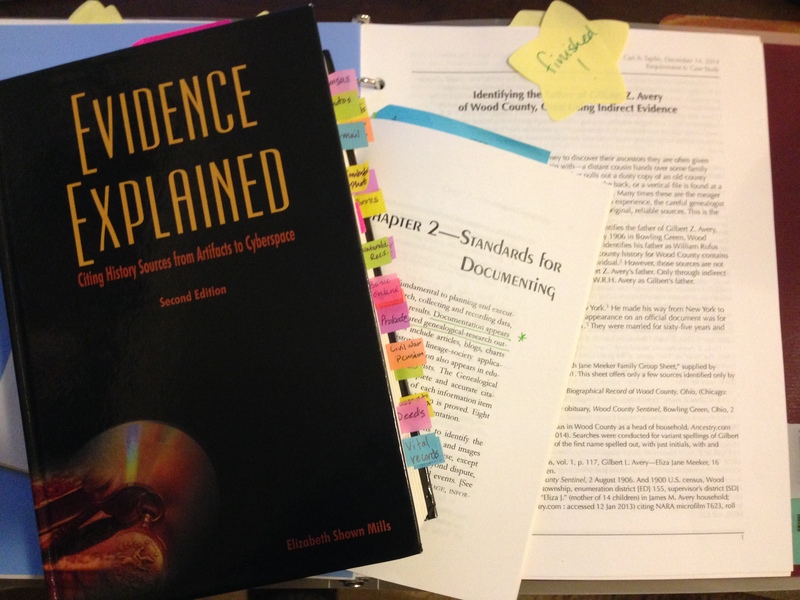 If you’ve never reviewed the Case Study requirements for the BCG portfolio, it basically requires that you use the genealogical proof standard to solve a problem of conflicting evidence or by using of indirect evidence. I know that I have many of these in my family research, but finding a good one can be challenging. And then, what happens when you start to work hard on it and then find that piece of direct evidence? … ah … back to square one. I did get through my pile of to-dos and either figured out that they had been done (recycled), or if they were easy to do (just did it), or they went into my Evernote to-do list (then recycled). Now, on to some research! So pray for my project, that I find no direct evidence on this man’s parentage and instead am able to locate a lot of really good indirect evidence! I turned in my BCG preliminary application for certification at the end of December, so I’m officially “on the clock” as they say here in genealogy land. It is a little stressful to think of all of the work that lies before me, not only for certification but also while pursuing a Master’s Degree. I have this unrealistic personal belief or maybe it’s my personality type, but I think I can get amazing amounts of work done and love to “climb big mountains” of tasks. I inevitably end up stressed out at various times, but usually I get the things done I say I’m going to do. There are several things in play that I believe will help me be less stressed and get my portfolio finished. First of all, I am in a group of other genealogists from my general area who are also “on the clock” or plan to be soon and we are working together reading the BCG Standards Manual and understanding the requirements. 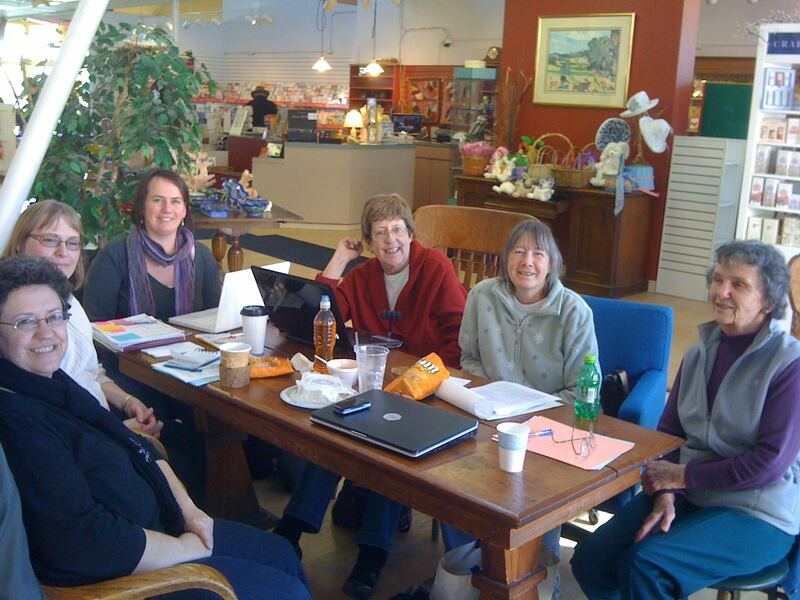 Also, I am a member of a smaller group, what I call my genealogy “support group.” This is a group of 5 women who have been meeting for many years to discuss what’s new in their genealogy journeys, basically a discussion outlet so our families don’t get bored with our ramblings. Third, while I am pursuing a Master’s Degree, the workload has been quite manageable, only overwhelming toward the end of the semester. Fourth, while I do still have kids at home, they are in school all day and I am not working right now, so, while I am poor, I do have uninterrupted time during the week days to work on BCG and homework. The BCG website gives a proposed timeline for how long certain projects will take. I began working on my portfolio, in a rather unorganized fashion, a few years ago. So I have at least some rough drafts finished on several of the items. So I feel I have a slight head start on some of the tasks. However, if by December of this year, I am not ready yet, they generously allow you to apply for an extension for 1 year for a nominal fee, which has taken some of the pressure off! Wish me luck!